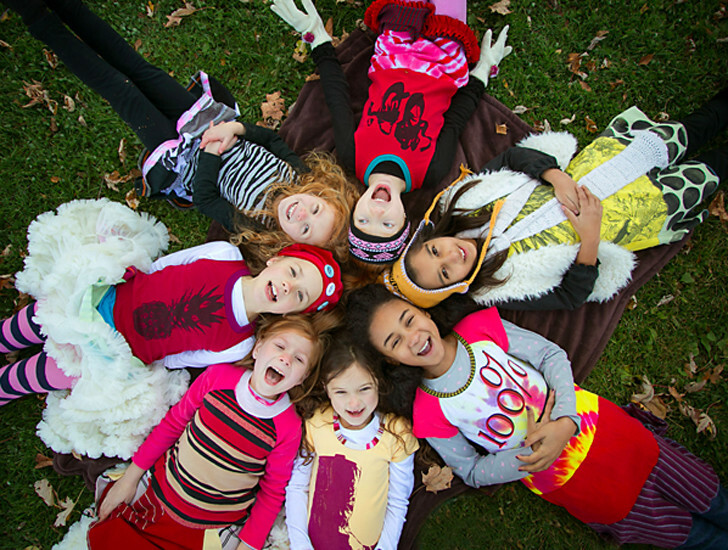 Chicago-based Courtney Chu first started selling her bright, bold and oh-so-wearable children's clothing on Etsy back in 2007. Since then her courtneycourtney line of upcycled t-shirt dresses and toddler rompers has developed something of a cult following. After setting up another outlet on Big Cartel and selling via a direct email list, Chu has recently re-opened her Etsy shop because, as she notes, that's where it all started and where she found her legions of fans. Run, don't walk! CourtneyCourtney Fashion for Kids from Ko Nakatsu on Vimeo. Like all good upcyclers, Chu sources her raw materials from thrift shops. Her out-of-town parents help with regular parcels of their own special finds too. Chu’s eye for the perfect raw materials is one of the qualities that sets her range apart from similar brands, and she seems to have an uncanny knack for finding vintage t-shirts featuring classic music acts, iconic holiday destinations and whimsical graphics. Chu also screenprints many of the clothes with her own designs including adorable bunnies, funky pineapples and her Love-Love-Love print. Another notable feature of courtneycourtney clothing is the quality: these clothes are made to last and can be handed on when a child outgrows them. Chu is a seasoned and impeccable seamstress and it shows. She started her studies in textile design back in high school, then continued on to major in Industrial Design at Pittsburgh’s Carnegie Mellon University. From there she went to work for a children’s fashion accessory company in Chicago and began the courtneycourtney clothing line as a creative outlet in her spare time. Mind you, by 2010 she was estimating that she had sewn more than 3,500 items of children’s clothing and her latest roundup of the previous month’s creations ran to 105 dresses and rompers. That’s quite an impressive output and a lot of artfully repurposed pre-loved clothing. The courtneycourtney range is available on Etsy, Big Cartel and by email subscription. You can also find courtneycourtney on Facebook. Turnover is fast and each item is unique, so don’t hesitate if you see the perfect piece! The clothing line caters to children ages 0 to 12. Rompers are priced in the $38 to $43 range, and dresses are generally priced between $47 and $57. RELATED | Car Motorway & Train Track Emblazoned T-Shirts Turn Parents into Playmats! Many new pieces from courtneycourtney incorporate fringing—just perfect for whizzing around in circles in! Like all good upcyclers, Chu sources her raw materials from thrift shops. Her out-of-town parents help with regular parcels of their own special finds too. Chu screenprints many of the clothes with her own designs including adorable bunnies, funky pineapples and her Love-Love-Love print. Chu’s eye for the perfect raw materials is one of the qualities that sets her range apart from similar brands, and she seems to have an uncanny knack for finding vintage t-shirts featuring classic music acts, iconic holiday destinations and whimsical graphics. A notable feature of courtneycourtney clothing is the quality: these clothes are made to last and can be handed on when a child outgrows them. Chu is a seasoned and impeccable seamstress and it shows. She started her studies in textile design back in high school, then continued on to major in Industrial Design at Pittsburgh’s Carnegie Mellon University. From there she went to work for a children’s fashion accessory company in Chicago and began the courtneycourtney clothing line as a creative outlet in her spare time. By 2010 Chu was estimating that she had sewn more than 3,500 items of children’s clothing and her latest roundup of the previous month’s creations ran to 105 dresses and rompers. That’s quite an impressive output and a lot of artfully repurposed pre-loved clothing. Fun screenprints and bold numbers feature prominently. Another brilliant thrift shop find transformed. The courtneycourtney range is available on Etsy, Big Cartel and by email subscription. The clothing line caters to children ages 0 to 12. Rompers are priced in the $38 to $43 range, and dresses are generally priced between $47 and $57. Turnover is fast and each item is unique, so don’t hesitate if you see the perfect piece! What a unique and original romper!